​Richard Parsons has been entertaining people all around the UK for a few years now with his charm and magic. We caught up with to take a look at the man behind the magic and discuss tough crowds, pick-pockets and of course, trickery! Was magic always your dream job as a child? No, unlike a lot of magicians who had the classic magic set I didn’t get into magic until my 30’s when a friend Mark Vasey -another Magic Circle magician- introduced me into the world of sleight of hand by sending me a book...it was simply a hobby and grew from there. I have a lot to thank him for as well as other magician friends along the way. What did your wife say when you told her you were going to be a full time magician? She’s always positive and supportive in anything I do and she knows that when I’m very passionate and get my teeth into something I will keep working at it until it’s a success -spending all my time and energy totally focused on a project. She does get a bit mad at all the magic stuff lying around the house though – there are decks of cards and other props everywhere. Have you ever messed up a trick? Yes but managed to recover so no one really notices but you do learn from these times too. It’s good to fail sometimes because you learn. Who is the most famous person you have performed in front of? No royalty yet but a few celebrities, I can’t remember them all and sometimes I don’t even know who they are until they are pointed out. Being based in Gloucestershire and the Cotswolds I see Dr Dawn Harper, Adam Henson and ex England rugby player Phil Vickery regularly and they are always lovely. Dr Dawn loves a bit of magic! Would you travel anywhere to perform for the right price? Yes, despite the website name Gloucestershire Magician I am happy to travel. This month I’m in Birmingham, Cheshire, London, Cotswolds and next year I have a confirmed booking for a wedding in Madrid, Spain as well as lots of other locations in this country. I have one with a cup and a ball that I perform at tables that I’ve worked on for years and it’s always a crowd pleaser. It’s a bit of a sucker trick where some people can kind of guess what is going on BUT there is a real kicker ending that blows peoples’ minds. "I have performed to a few celebrities - Dr Dawn Harper loves a bit of magic!" Is there a busy period or is every month crazy? A couple of years ago it used to be Summer months and December for office Christmas parties but these days people get married and have corporate events every week of every month so now it has really evened out across the whole year – every month is busy now. Are your children good guinea pigs? Are they wanting to following your footsteps? pulling a few strings) – Dynamo is obviously a much cooler magician than me to show off at school. Who/where was your toughest crowd? Christmas parties can get rowdy sometimes but I don’t take it personally, there can be a lot of alcohol flowing at these events! I have to say that in my experience 99% of the time people are fine and really appreciate good entertainment but once in a while if someone truly is difficult you just ignore it, stay professional and move to the next table. Actually quite often the rest of the table will stick up for me and have a go back at them – I don’t have to do anything in those situations the other guests do it for me. But to be honest it’s rare. ​You perform at many events - is there a particular one you remember? Yes earlier this year I was very fortunate to be flown to Venice, Italy for three large corporate evening events and spent five days there performing and sightseeing with three other entertainers where we formed a real bond and remain good friends now. I had a suite in the JW Marriott Venice hotel on its own private island, accessible only by private speed boat, so for a short while I really did feel like I’d made it in showbusiness! Where are you favourite places to perform in the Cotswolds? That’s a difficult question, I don’t want to offend anyone if I miss them out. There are too many to mention them all but I really enjoy performing at Manor by the Lake, Dormy House, Foxhill Manor, Slaughters Manor / Slaughters Inn, The Swan at Bibury and Berkeley Castle to name just a few...I know the staff at all these places really well. ​What are your plans for future as a magician? older I quite fancy venturing into that area, maybe combined with magic or perhaps even without it. In ten years time I can see myself hosting an awards ceremony rather than going round the tables doing close-up magic...but to be honest I’m not sure I’m just enjoying what I’m doing at the moment. ​What do you do to relax in your down time? The last six months I have really got into Strala Yoga with a wonderful teacher / guide called Sarah Jane (SJ) Griffiths. You can get strong and flexible and it really helps to iron out all the aches from gigs and driving. SJ has really made me fitter, healthier and even slimmer - yoga is very addictive once you get into it...I’m working on handstands at the moment. I also love watching sport with the family we are sport mad– we are soon going to Wembley to watch an NFL game live. We see you are working the Police to raise awareness of pick-pockets.Were you surprised by how easy it is? providing an easy opportunity for criminals. You should always cover your PIN number too when typing it in. What sacrifices have you had to make to fulfil this as a job? What is the best advice you could give a budding magician? That would depend on whether or not the person wanted to perform magic as a living. If they did I would say develop some people skills and social skills as well as magic skills. It’s important to be able to have conversations and get on with all types of people not just at the event but even from the very first phone call. My mindset also changed when I thought of myself as an ‘entertainer’ not just a ‘magician’. So that would be my best advice, it’s not just about the magic trick, it’s also about you, and how you make people feel. If they like you, they will (probably) like your magic! And finally.. How would your best friend describe you? I asked one of my best friends Charlotte! She texted back: ‘Funny, loyal, thoughtful, caring and a good listener’ At least I think that’s what she said - I wasn’t listening!! Book the Gloucestershire Magician for your next event! 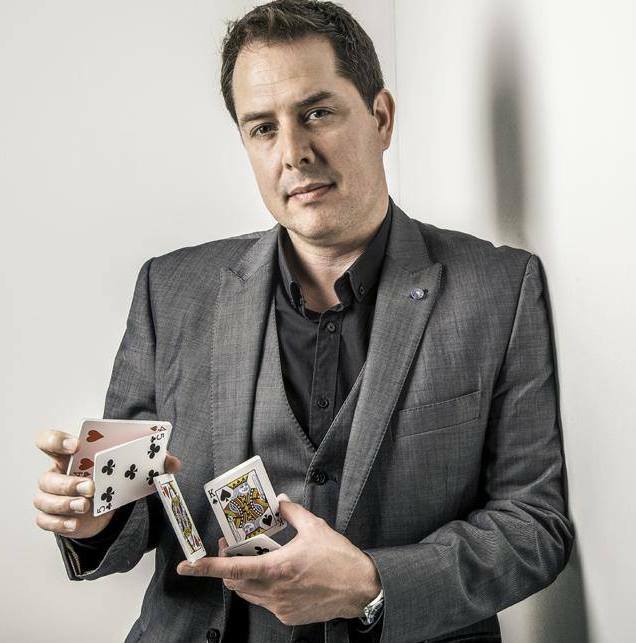 ​Visit www.gloucestershiremagician.co.uk for more details, videos and to contact Richard or follow him on twitter @Glosmagician!